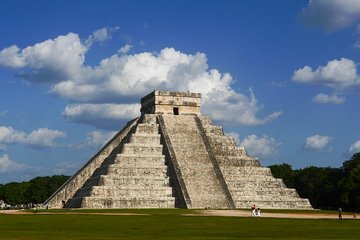 Eine frühe Abholung von Ihrem Hotel bedeutet, dass Sie die archäologischen Schätze von Chichen Itza vor den Massen und der Hitze erreichen. Ihr Guide zeigt Ihnen die Umgebung und erzählt Ihnen die Geschichte der Website, bevor Sie sich etwas Zeit für sich selbst nehmen. Von dort aus ist es Zeit, sich im Cenote Ik Kil abzukühlen. Beenden Sie den Tag, um die Stadt Valladolid zu entdecken. Really great tour, would recommend. The guides give you time to rest on the very early transportation and provide a small packed lunch with fruit and biscuits. They did the tour in both english and spanish and we separated into two different groups at chicken iza for the tour. We were also given 45 mins free time at the site to explore on our own. However, there wasn't much time to see other areas that I was interested in as the tour had only concentrated on the main square and took a long time. The stop off in Valladolid was interesting but we had no guided tour here and were just told to have a look at the palace and a chocolate shop. It was an interesting place anyway and we had a nice coffee in a cafe. The cenote stop was nice but a very busy touristic cenote, the buffet lunch here was nice and there is a cheap tequila stall as you go in! In all ht guides looked after us well and provided water which was needed as it was so hot!